People engaging in the latest spooky craze Charlie Charlie Challenge risk being possessed by demons according to a Vatican exorcist. The Challenge is a Ouija board-esque game and the hashtag #CharlieCharlieChallenge has caught on like wildfire this week with more and more people engaging in it. The Challenge involves placing two pencils on a paper to form a cross. The top pencil balances precariously on top of the bottom one with Yes and No options written at diagonal positions on the paper. When the top pencil topples then participants get their answer from the other side. The question that is being answered is "Charlie, Charlie are you here". 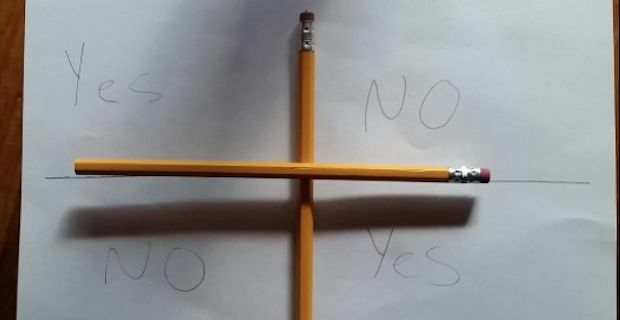 Should the pencils reveal Yes then it means that an evil demon known as Charlie is available to communicate with and moving the pencil is how the spirit is able to communicate. Spanish exorcist Jose Antonio Fortea has warned of the trouble participants could face by engaging in the game. He said contacting Charlie could open the floodgates and "result in other spirits beginning to enter into even more frequent communication". Fortea believes that there is a real risk of possession that everybody that plays the game "won't be possessed". The exorcist warned "The person really can suffer much worse consequences from the demons" once the lines of communication have been opened up.